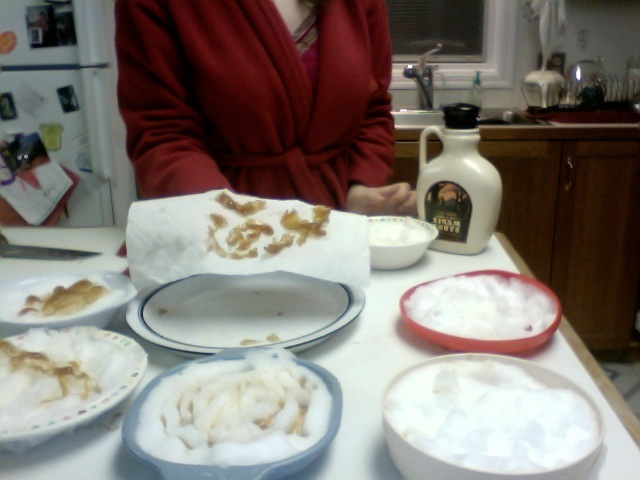 Having read the Laura Ingalls Wilder books as a child, it appears that I share with several friends a long-harbored ambition to make maple candy on snow! Well, we have a snowstorm: 6 to 8 inches so far (15-20 cm), and we may get as much as a foot (30cm). Hopefully I won’t lose power; I’ve taken some pictures. 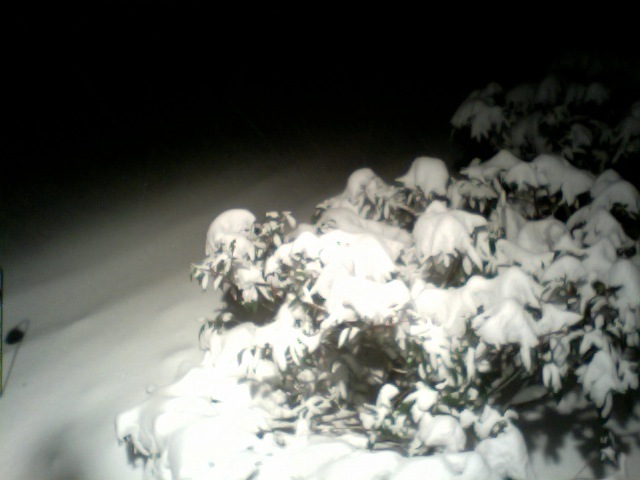 I can't take a good picture of the snow in my yard without daylight, but here's a bush right outside the door. 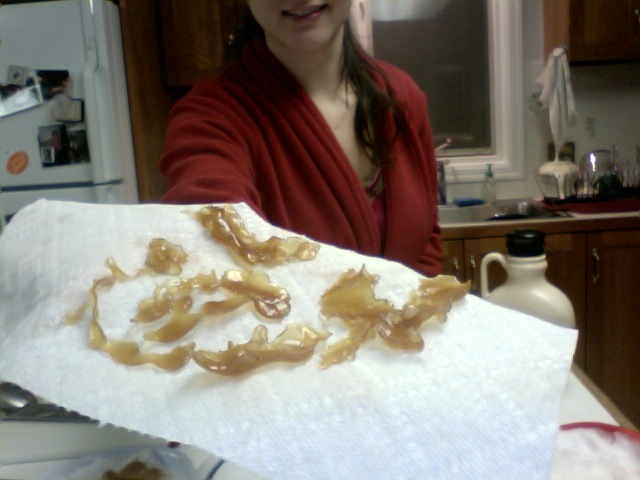 Advised by the top three Google hits for “how to make maple candy with snow”, we boiled half a cup of maple syrup with a tiny bit of butter up to 230 F, gathered several bowls of clean snow (but for acid rain), and ladled patterns into them, let them cool, and ate chewy candy. That's my sister Diana in the background! I gathered, she poured. The longer you heat the maple syrup, the harder they get; but leaving them in the snow longer made some of them a bit harder anyway. Keeping them is tricky: I’m sticking some in the freezer on the bowls of snow, because I’m afraid melted snow may dissolve them. Oh, also, do NOT use a paper towel except for preliminary drying. Wax paper. I told Diana to deal with the last few, and she got them stuck to the towel! Later: the frozen ones are great. My hands currently have a blueish tinge. This is because I spent the afternoon dyeing wool and yarn with a non-blogging friend, and didn’t bother with the whole gloves thing. The process wasn’t as scary as I thought it might be. 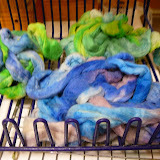 We laid out saran wrap and then put down the roving and painted it in sections. I also made myself gloves last week. Gloves that fit. I had never made gloves until now; I had been really afraid of them. But they were so quick and easy! And they are the first pair of gloves that I’ve owned that fit, ever. I took the photo before I had a chance to weave in the ends, but it’s enough to get an idea of them. Finally, there’s more alpaca yarn from my friend’s alpaca farm. I’m spinning all of the fleece from their farm, and in return I get to keep half of it (or half the profits if I can manage to sell it; not sure if that will actually happen). Here’s one of the 3 skeins that I put in the store. It is rose grey. …in which curiousity kills the silkspinner. I recently found some interesting variegated gold yarn and made an extremely simple scarf for my grandmother, pictured below. Upon finishing, I was left with an impractical skein and a half extra of the yarn, not enough to really do anything with. However, I also had a tiny amount of some purple flax yarn my sister had recently brought me, and the two looked fairly nice together. Clearly a bicolored project was in order. At this point it occurred to me that, while I’d been learning about cabled knitting for the past year, I hadn’t seen many projects featuring multiple yarn colors and cables. I wasn’t sure if this was because a) mixing colors in a cabled project and producing a nice effect is difficult or impossible, b) sane people reasonably think that you shouldn’t distract attention from intricate patterns with unneeded complexity, c) said projects existed and I merely hadn’t seen them, d) that sort of thing makes a project awfully hard to block, or e) other. Ergo I decided to find out if I could knit a small scarf with gold cables but purple background. The answer to this question turned out to be yes, I could, but only if I was clever in my choice of pattern. My first attempt turned out to be wrong in every respect — the pattern had the cable strands staying in one place and twining around each other, such that the large stretches of unbroken background tended to clump displeasingly and it was hard to tell the crossings of the gold strands apart from the color changes in the yarn. I switched patterns to one that had lots of cable strands moving rapidly over the background (found here, originally sent to me by hobbitknitter: http://thestormmoon.blogspot.com/2008/03/free-pattern-celtic-cable-neckwarmer.html). This attempt went rather better, although it was still troublesome that the background yarn was slightly thicker than the cable yarn. The other way around might have been better. Finally I wound up with the following. I’m fairly pleased with it. I think eventually I might try a larger project of the same kind, although of course that would require a good deal more planning. I wanted to make tangrams for my school, and I discovered that lined 3”x5” index cards are perfect for making tangrams! This is because the distance from the top line to the bottom line is exactly 2.5” and the lines are 1/4” apart, so the middle line is marked. 0. You could cut off the top and bottom outside the lines if you want, to give yourself straightedges and not get confused. Or you can do that at the end, and use another index card for a straightedge and perpendicular. It's hard to see, but the topmost index card is showing the diagonal on the bottom, which meets the pencilled line in the middle. 2. Start the diagonals in the other square, but only to the center point of that square (which, again, you can find using the index card’s middle line). Now you have the medium-size triangle. 3. Using the other index card to make a perpendicular line, draw a vertical line halfway up in the middle of the second square. Mark the same line at the top. Now you should have the square and one small triangle. 4. Draw the last diagonal from the side of the card to the midpoint of the top line, so that you have the parallelogram and the other small triangle. I am in the Madrid Café at 45th and Sansom, Philadelphia. The owner was happy to try tangrams. I also discovered a tangram alphabet, whence the title picture. Finally, I made my own “paradox.” I’m sure this has been done and googling will reveal it; nevertheless, I invented it myself. 🙂 Having gone back to tangrams with a much more mathematically trained mind than I had as a child, I always consider the lengths of sides and parallel positions and so on, so it’s much easier to solve tangrams and to puzzle out things like that.